12-Year-Old Researches Male & Female App Characters – Media! Tech! Parenting! 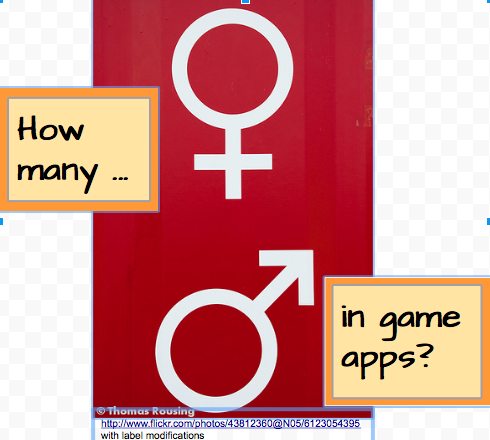 In her piece, Madeline describes how she began to notice that male characters in many of the apps that she uses are treated differently from female characters. With parent help (purchasing the apps), Madeline conducted an experiment, studying 50 apps, keeping track of the available characters, noting whether additional characters needed to be purchased, and even more importantly, how much it cost to buy them. Her discovery? Many of Madeline’s favorite apps required her to pay more money to play as a woman than as a man. Her article even includes a graphic of her notes, demonstrating how she examined each of the apps. Those of us who raise and guide young people need to help them understand — and also remind ourselves — that developing the skills to conduct small research projects and then go about clearly explaining the results continues to be as important as ever. One only needs to observe how many young entrepreneurs, in such a hurry to create slam-dunk products that may earn them billions of dollars, don’t possess the investigative or communication skills to consider the effects and potential consequences when products get into the hands of consumers — and especially those consumers who are pre-adolescents and teens. Good for you, Madeline. You’ve reminded us that part of the product creation process — no matter how the creation process occurs — involves thinking about how it will affect people. Next Post So What Else Can Google Do?